Next Trail Workday – May 5! On Saturday May 5th, EVTA plans to complete our annual maintenance on the Nature Trail, which begins in Elkin’s Municipal Park. 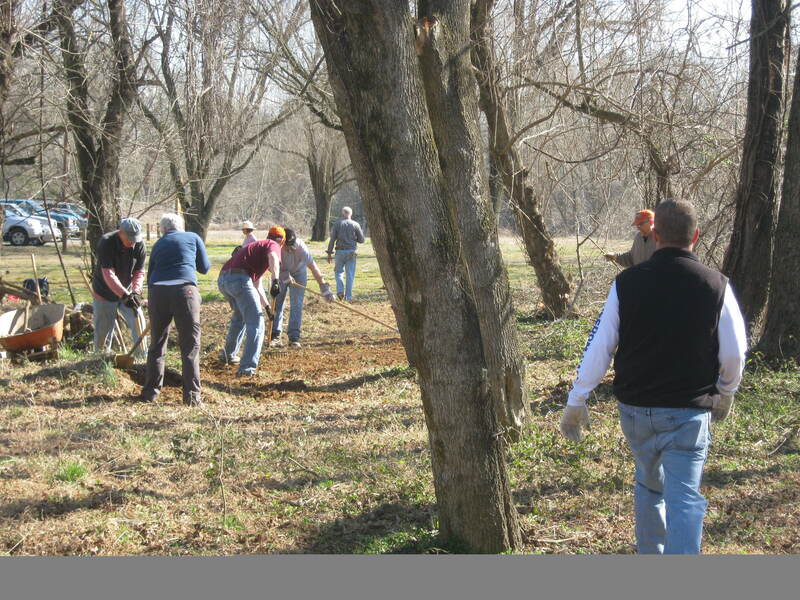 Most of the work will consist of clearing vegetation away from the trail along Big Elkin Creek. Bring loppers, shovels, gloves and long pants. There is poison ivy along the trail. Chainsaws are not needed. Meet at 9 a.m. in the parking lot beside the Elkin Recreation Center. Plan on spending about an hour or two, or as long as you want to participate. Friday, June 8 – Tour de Yadkin with the Yadkin Riverkeeper. Paddle from Ronda to Elkin and then enjoy a “Night in the Village” with Tour de Yadkin paddlers in Downtown Elkin. Saturday, June 9 – Eagle Scout Canoe Rack Dedication at Crater Park and then a morning hike with EVTA members and the Yadkin Riverkeeper along the future E&A Rail Trail in Elkin; followed by paddling to Carolina Heritage Vineyard. Tues, June 26 – Elkin Valley Trails Association “Boots & Bridges Boogie” Fundraiser to build two suspension footbridges crossing the Big Elkin Creek on the E&A Rail Trail. At the Liberty in Downtown Elkin – with Dennis Gruenling and the Jeweltones! Home » Next Trail Workday – May 5!